So much of foundational education of health practitioners is focused on what the professions already know and is well established. Given the amount of time the professions require to accept new areas of learning and practice – often decades – most practitioners quickly recognise that while what they learned at university was a good start, seldom does it prepare them for the diversity of real life challenges, nor for the rapid development in many areas of endeavour. The continuing professional educational requirements of most health professionals is ample evidence of the understanding that knowledge about human health and the functioning of the body is rapidly evolving. At the heart of all learning is the quality of humility. If health professionals become arrogant, believing they have learned everything there is to learn about their profession, their hubris may directly harm patients. It should also be said that simply deepening one’s knowledge of the things one already knows while valuable in and of itself, cannot be said to represent a humble posture of learning. Rather, being open to knowledge from other areas of study, from other professions is what can lead to a broadening of one’s knowledge sphere. A greater understanding of the interventions required to care for the uniquely complex system of the human body is the result of this approach. The Tongue Tie Institute seeks to support health professionals to develop their understanding of oral restrictions in a manner that is both comprehensive; avoiding narrow focus on one area of the body or symptom; and multi-disciplinary, recognising what many enlightened practitioners have long known – operating in treatment silos seldom results in the best outcomes for patients. Dr Dan Hanson and Dr Marjan Jones first met on a Myobrace course. Dan’s presentation on the effects of the importance of good myofunction on orofacial development resonated strongly with Marjan’s focus on treating tongue dysfunction on infants and her recognition of the critical role of breastfeeding in orofacial development. Each was looking at the same challenge at different life-stages and from different angles but both immediately recognised the implications for their work of the other’s area of focus. While Marjan’s attendance at the Myobrace course was initially intended to find preventative orthodontic solutions for her paediatric clientele, she found that the Myobrace system was well aligned with the notion of restoring tongue function and normal habits as young as possible. Meanwhile Dan was fascinated to hear of the impact of laser release of tongue ties in infants and the resultant restoration of function to the tongue, particularly to address breastfeeding issues. 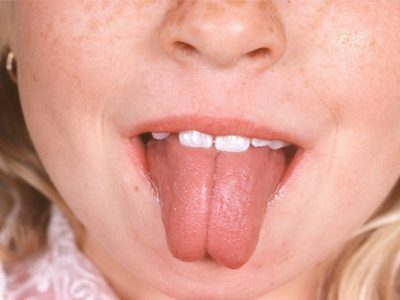 He noted that on closer observation, a large proportion of his orthodontic patients displayed a degree of tongue restriction and he believed that addressing the tongue restriction would help address functional issues that had resulted in malocclusion. Their conversation at the course resulted in the desire to learn from each other and improve patient care on every level possible. In addition to Dan first observing then working with Marjan at her practice, Enhance Dentistry, and setting up his own tongue tie clinic at Heal Dental Care, it became increasingly apparent that there was a pressing need to educate others more comprehensively about the effects of orofacial development and oral restrictions. With this desire also shared by Anton Jones, co-owner of Enhance Dentistry, the Tongue Tie Institute was established to share their great passion in this area with those who wished to learn. 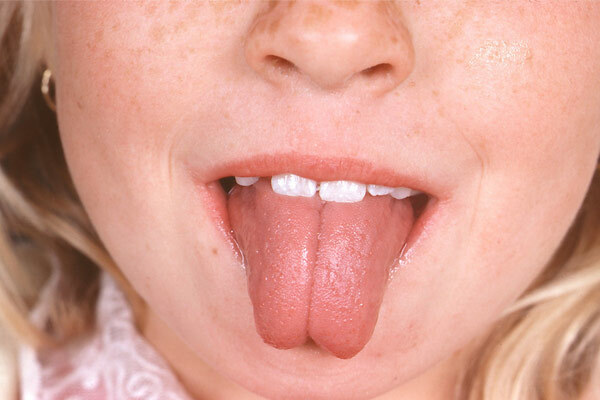 Excess saliva, lower lip support, widening of tongue when protruding. Cup shaped tongue when attempting intra-oral elevation.